Just about everybody has an opinion about Donald Trump these days. Both here in the U.S. and abroad, political pundits have taken the opportunity in the last few weeks to sound off about the Republicans' de facto choice for president. Mexico's former president, Vicente Fox recently used his neck ties and tweets to call attention to Trump's inconsistent political platform. So did a former Miss West Virginia, who called out Trump last week for his uninformed generalizations about Latino cultures. After Trump posted a photo of himself on Twitter dining on what he called an "Hispanic" Cinco de Mayo taco bowl from Trump Tower's kitchen, Andrea Mucino offered a fact check. Trump really could win the presidency. 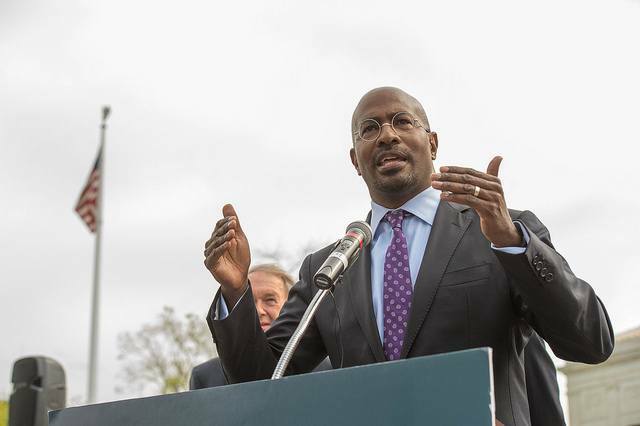 In fact, opines CNN political correspondent and former Obama aide, Van Jones, he probably will. If that sounds terrifying -- and it should says Jones -- voters have only to look to the stats that disenfranchised Democrats are helping to build, and African American voters have the power to turn around. The call is still out as to whether Dems in general are defecting to the Trump camp, but stats do suggest that the black Democratic vote could be in jeopardy at the present time if Hillary Clinton becomes the party's candidate. According to New York Post writer Carl Campanile, the number of African Americans who voted in Democratic primaries took a nose dive in March, especially in key states like Ohio and Florida, where the number of black voters who turned out to vote in Democratic primaries were extraordinarily low. He based his story on Black Lives Matter statistics that suggested that the black vote isn't a sure thing if Hillary wins. But what may give Trump his greatest ability to shatter historic voting blocs says Jones, is, ironically, the trend that elected the country's first black president: New media and the savvy ability of a candidate to use it as a megaphone for his or her cause. Trump's legendary role models surprisingly haven't been Republicans, but Democrats. Franklin Delano Roosevelt, John F. Kennedy and Barack Obama all used the new media of their time to surprise, titillate and capture voters' attentions. "FDR changed the rules of the game because he mastered radio. He was able to take radio and just completely master that. Then you had JFK and JFK was able to master television — new medium, new master, new president." Obama's champion use of mediums like online fundraising and social media not only transformed how candidates fundraise, but how they reach out to us before we head to the polls. Trump's modus de operandi has been reality television, a medium that not only projects a message but seems convincingly real. And his ability to use the talents of social media gurus who can then wrap that message into a succinct 140-character message drills home the Trump-made concept -- whether it's accurate or not. "It’s a new media era, the era of social media, especially Twitter and reality television,” says Jones, who was the momentum behind a list of social enterprises that have helped to bring social justice issues to the fore in recent years. But it is the public's misinterpretation of Trump's ongoing "gaffs" and outrageously insulting comments on social media, he says that is the most alarming. "The outrageous things he says are in fact, not breaking the rules." Sure, Trump lost some ground when he insulted women with proposed penalties for abortions, or when he stated he would cancel the U.S. membership to NAFTA. But on the whole, his extremist statements have worked to his favor. "You don’t get fewer followers when you insult somebody on Twitter, or say something outrageous on Twitter, you get more followers." His taco bowl photo insulted millions of Americans and untold Hispanic viewers around the world, but it garnered media headlines like, "Donald Trump broke the internet on Cinco de Mayo with just one photo," and Trump taco bowl tweet blows up Twitter." For Trump the candidate, repairing his rapport with the Latino community wasn't what was important. Gaining new viewers was: those social media viewers Trump has in the past, categorized not as voters, but "fans." All of this, says Jones, points toward a calculating strategy that took the Republicans by surprise and risks fooling the Democrats as well. And it's an alarming strategy that could win him a much-needed audience when he starts his stumping in the African American communities around Detroit, known for high levels of poverty, unemployment and angst about NAFTA. It's there that Trump stands to win those votes that he needs, that additional 22-30 percent of black voters yearning for change. It's also in depressed areas where jobs have been scarce, says Jones that Trump can promote his anti-immigrant message. "You mean you can’t find three black folk out of twenty [in the rust belt] who might fall for that kind of anti-immigrant message and that anti-NAFTA message and that anti-poverty message?" he challenges. "This is Trumpzilla," he warns. "We are making the same mistake as liberals that the Republicans did. All of us progressives need to come together." And if recent attacks by Trump and Trump supporters against those he sees as his rivals are anything to go by, Democrats should be very worried. "Trump will unleash hell on the Latino community … he will unleash hell on the Muslim community," Jones predicts, noting the appointment of Supreme Court justices by Trump could change U.S. political momentum for years to come. "We need to mobilize the entire nation to recognize the dangers of giving a man like this the FBI, the CIA, the NSA, IRS, and the Pentagon to attack whoever he wants to, and that is before he even gets to Congress to pass a bill." Whether Van Jones' message will ring true with those disenfranchised Democratic voters who were hoping for Bernie and feel their votes have been discounted by Hillary, is yet to be seen. Celebrities and pundits ranging from comedians to journalists in various parts of the globe have stepped up in recent months to express concern about Trump's presidential platform and its threat to world politics.